Portable 3D Scanners: Is It Possible to Scan Everywhere? 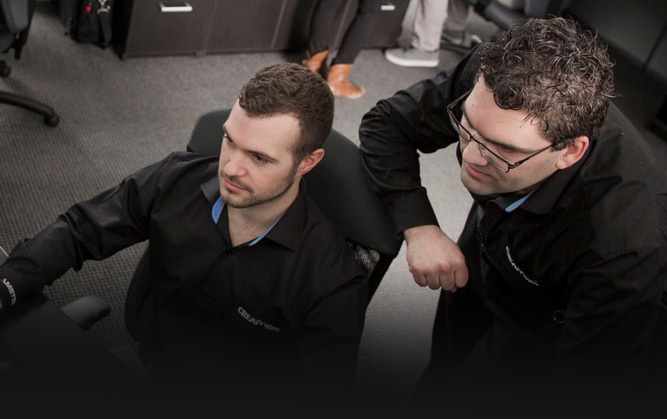 We already know that our 3D scanners work great in labs… And that our clients use 3D laser scanners for a really wide variety of very demanding applications. But frankly, one of their most distinctive benefits lies elsewhere. And by elsewhere, we do not only mean metaphorically… The thing is they really do shine in the field, in difficult environments, even in the craziest conditions! Always willing to push the limits, we decided to attempt a little experiment with our handheld 3D scanner… And to capture it on video, which is the first installment you see today. The goal of the project was to showcase how the three key features of our laser 3D scanner, TRUsimplicity, TRUaccuracy, and TRUportability, actually apply in real life. TRUsimplicity: 3D scanning is made as easy as possible. Our laser scanners are ready quickly, can be used by everyone regardless of their skill levels and capture data fast and simple. 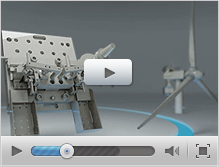 TRUaccuracy: We promise the same precise and reliable results, no matter the context or conditions. Period! TRUportability: Small, lightweight, handheld, and easy to carry, our professional 3D scanners can be used anywhere. They provide freedom of movement at its best! As part of the experiment, we decided to scan the same object, first in a more traditional fashion –in a lab with ideal conditions-, then while performing a wilder activity! 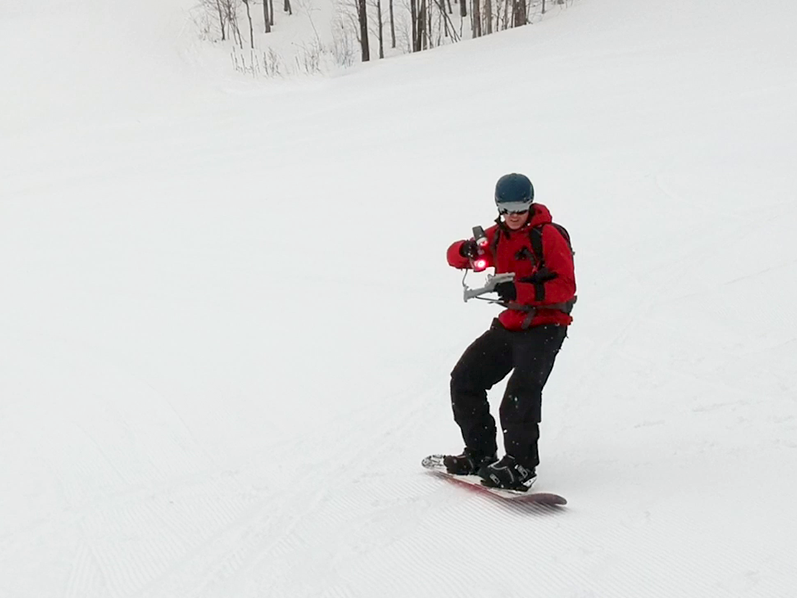 And since our application engineer enjoys snowboarding in his spare time, why not try exactly that? 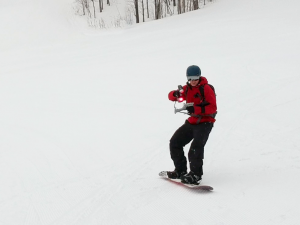 Equipped with a handheld HandySCAN 3D, a tablet strapped on his arm for following the acquisition progress as well as the part to be scanned, our application engineer went and performed what was probably his wackiest scan ever, while riding down the slopes. A GoPro-type camera affixed to the tablet showed how the scanning data was captured in real time. This scanning session, although admittedly a little out of the ordinary, perfectly highlights how portable, simple and fast our 3D digitizers are in capturing data from various objects. 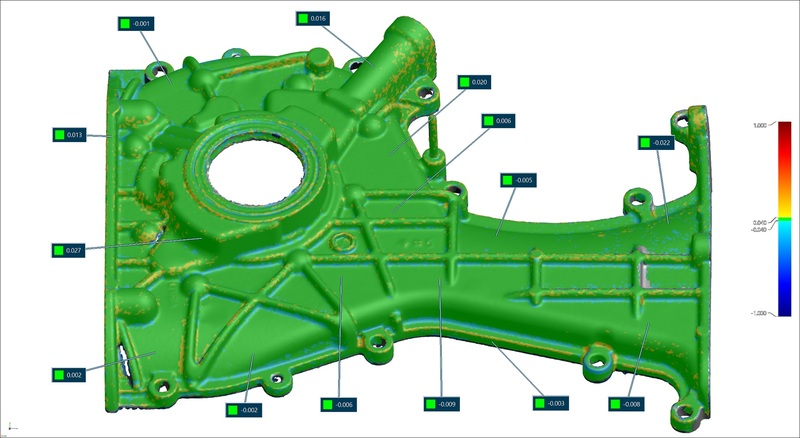 And What About 3D Scanning Results? When we compared the results of the two different scans, we were very happy but not surprised to see that the data precision was not affected by the slopes scanning at all. Indeed, the colormap between the lab scan and the slopes shows that most surfaces are within 40 microns (or less than 0.040 mm) and most deviation are localized in small radius where chord error may occur. (It’s important to note that the part has been kept at ambient temperature except for the time of one run to be able to compare both scans without the effect of thermal expansion.) All this means that yes, there can be a minuscule difference between the data captured but that both the accuracy and reliability of the data wholly remain! 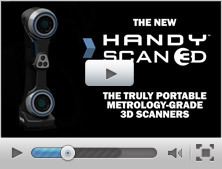 Make sure to watch the video to see our HandySCAN 3D live in action. And stay tuned, as we will soon unveil the next experiment of this very exciting project!